The week saw startup deal activity pick up with as many as 19 companies being funded, up from just seven during the previous week. Bangaluru-based startups stole the show by bagging the most number of first cheques. Mumbai-based bike tour operator Enfield Riders Pvt. Ltd, which conducts motorcycle tours, raised just under half a million dollars from a wealthy individual who runs a construction firm. Gurgaon-based travel insurance and forex marketplace YuMiGo raised $300,000 from businessman Hemant Sahni. The startup has also announced the launch of its travel website that helps international travellers while planning and also during the trip. The week also saw Hyderabad-based tech-enabled motorbike rental startup Tazzo Technologies Pvt. Ltd receive seed funding worth around $227,000 from investment company DSG Consumer Partners. Tazzo will use the funds to enhance technology, build its fleet and expand to more markets. 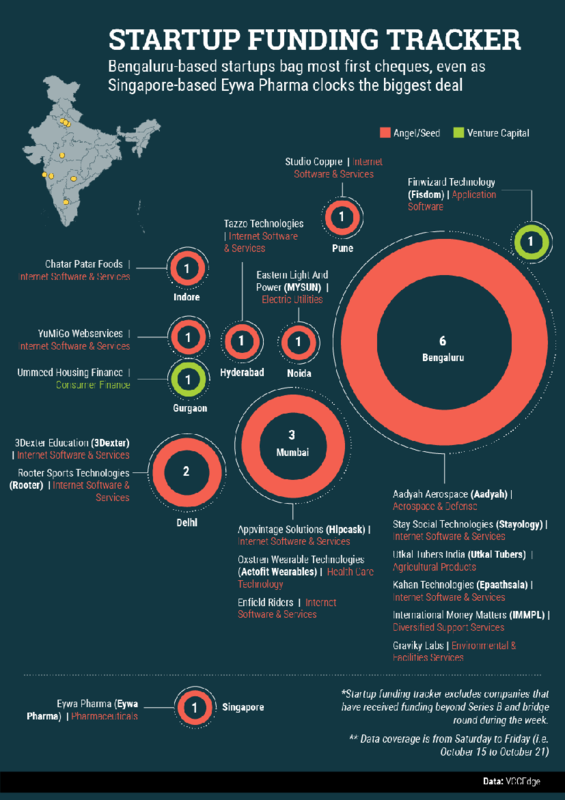 Although 10 of the 19 startups funded during the last seven days were in the technology space, the biggest deals were clocked by Singapore-based generic drugmaker Eywa Pharma, Gurgaon-based Ummeed Housing Finance and wealth management app Fisdom.